A Mommy's Adventures: A great deal! Today we took a trip to Border's Bookstore to check out their bargain books. We always find such great deals in this section. 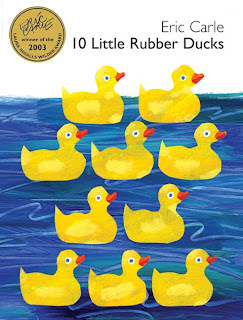 Today we found the book 10 Little Rubber Ducks, written by Eric Carle for $4.99. It is a hardcover book with a surprise squeaking rubber duck sound at the end. The inspiration for Eric Carle's book 10 Little Rubber Ducks actually came from the true story of a shipment of rubber ducks and other bathtub toys that fell overboard and washed up on shores all around the world. A great book for teaching ordinal numbers or marine animals!! I can't wait to share this book with Emily. We will be able to do some fun projects with rubber ducks!